Can't think of what to give? Don't know their size? 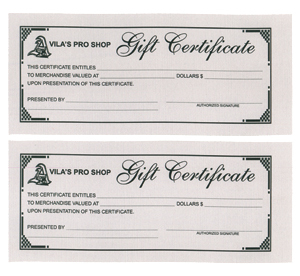 Avila's Pro Shop gift certificates are sure to please everyone, especially the one who is hard to shop for, or the person "who has everything". Gift Certificates are available in varying amounts. 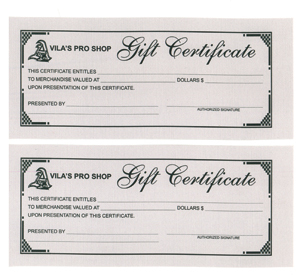 Gift certificates can be redeemed by entering your Certificate Code during the checkout process. The certificate code will be emailed to you within 48 hours of your order confirmation. Please order gift certificates below or call 800 234 6771 to purchase a gift certificate of any amount and to ask questions.